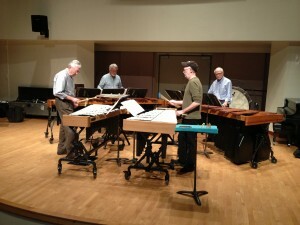 NEXUS is deep into rehearsals for their performance of Steve Reich’s Mallet Quartet at CELEBRATE WITH SOUNDSTREAMS! 30th Anniversary Season Spectacular concert on Thursday Oct 11 at Koerner Hall here in Toronto. Don’t miss out, get your tickets NOW. Last time NEXUS performed this piece at Koerner it was sold out! And it’s going to be an amazing evening. As well as Mallet Quartet, Garry and Russell are going to perform Reich’s Clapping Music. As you enter the lobby of Koerner Hall you will encounter Omar Daniel’s new work for voice and live interactive electronics. For the new Schafer piece the strings and vocalists are staged in an intermixed circle! This will have the effect of the sound swirling around between the vocalists and strings. Find out more about What It Takes to Celebrate Soundsteams, here. You can check out the House Program and complete Program Notes here. And DON’T FORGET about the FREE workshop with NEXUS and Swiss drum set artist Fritz Hauser on the afternoon of October 12th at the University of Toronto. Read more about that, here. What an amazing evening with Steve Reich!